Susan Bennett Brady received her Bachelor of Music in Harp Performance (1983) and a Certificate of Special Studies (1984) from the esteemed Curtis Institute of Music in Philadelphia. Her major teachers include Marilyn Costello, former principal harpist with the Philadelphia Orchestra and Marjorie Tyre, former principal harpist with the Metropolitan Opera Orchestra, Kathryn Case Holm and Frances Miller. 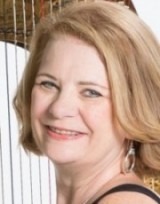 Susan Bennett Brady served as the faculty harpist at the Brevard Music Center in North Carolina from 1991 to 2001. Her responsibilities there included performing as principal harpist in the Brevard Music Center Orchestra, teaching and coaching the harp students in solo and orchestral literature, performing chamber music, directing the harp ensemble and delivering numerous harp related workshops. and intensify preparation for solo performances, orchestra auditions and competitions and is currently in its fourth year. Through her work at the Young Artist’s Harp Seminar, Ms. Brady has impacted the lives of countless ambitious young harpists, now realizing their dreams as acclaimed harp professionals.